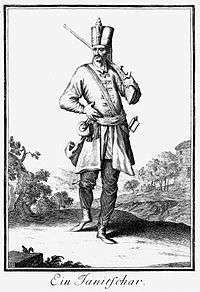 A Janissary musketeer. The entire Janissary corps was disbanded during the Auspicious Incident. The Auspicious Incident (or Event) (Turkish: (in Istanbul) Vaka-i Hayriye "Fortunate Event"; (in the Balkans) Vaka-i Şerriyye, "Unfortunate Incident") was the forced disbandment of the centuries-old Janissary corps by Sultan Mahmud II on 15 June 1826. Most of the 135,000 Janissaries revolted against Mahmud II, and after the rebellion was suppressed, its leaders killed, and many members exiled or imprisoned, the Janissary corps was disbanded and replaced with a more modern military force. Since the early 17th century the Janissary corps had ceased to function as an elite military force, and had become a privileged hereditary class. Many Janissaries were not soldiers, but still collected pay from from the Turkish state as dictated by the corps. The corps held an effective veto over the government, contributing to the steady decline of the Ottoman Empire. Any sultan who tried to diminish the status or power of the Janissaries was immediately either killed or deposed. Over time it became clear that for the Ottoman Empire to be a major powers of Europe, it needed to replace the Janissary corps with a modern army. The number of Janissaries grew from 20,000 in 1575 to 49,000 (1591) and 135,000 in 1826. When Mahmud II began forming a new army and hiring European gunners, the Janissaries mutinied as usual and fought on the streets of the Ottoman capital, but the militarily superior Sipahis charged and forced them back into their barracks. Turkish historians claim that the counter-Janissary force, which was great in numbers, included the local residents who had hated the Janissaries for years. Historians suggest that Mahmud II purposely incited the revolt and have described it as the sultan's "coup against the Janissaries". The sultan informed them that he was forming a new army, the Sekban-ı Cedit, organized and trained along modern European lines (and that the new army would be Turkish–dominated). The Janissaries saw their institution as crucial to the well-being of the Ottoman Empire, especially to Rumelia, and had previously decided they would never allow its dissolution. Thus, as predicted, they mutinied, advancing on the sultan's palace. Mahmud II then brought out the sacred standard of the Prophet from inside the treasury, intending all true believers to gather beneath it and thus bolster opposition to the Janissaries. In the ensuing fight the Janissary barracks were set ablaze by artillery fire, resulting in 4,000 Janissary deaths; more were killed in the heavy fighting on the streets of Constantinople (the capital of the Ottoman Empire and the center of the Janissary order). The survivors either fled or were imprisoned, their possessions confiscated by the Sultan. By the end of 1826 the captured Janissaries, constituting the remainder of the force, were put to death by decapitation in the Thessaloniki fort that soon came to be called the "Blood Tower" (but which has been, since 1912, known as the White Tower). Roughly 100 other Janissaries fled to the Cistern of Philoxenos where many drowned. The Janissary leaders were executed and their possessions confiscated by the Sultan. The younger Janissaries were either exiled or imprisoned. Thousands of Janissaries had been killed, and thus the elite order came to its end. The Sufi Order of the Bektaşi Brotherhood, a core Janissary institution, was outlawed, and its followers executed or exiled. A new modern corps, Asakir-i Mansure-i Muhammediye ("The Victorious Soldiers of Muhammad") was established by Mahmud II to guard the Sultan and replace the Janissaries. Many ordinary Janissaries, especially in the provinces, began rogue revolts and demanded autonomy. Christians in the Balkans became very hostile to their Muslim convert neighbors and began to rally against the new Turkish armies sent from Constantinople. Some Janissaries survived by keeping a low profile and taking ordinary jobs. Immediately after the Janissaries had been disbanded, Mahmud II ordered the court chronicler, Mehmet Esad Efendi, to record the official version of events. This account, Üss-i Zafer ("Foundation of Victory"), was printed in Istanbul in 1828 and served as the main source for every other Ottoman account of this period. The incident had a negative impact on the newly converted Muslims and their communities in the Balkans, who lost their privileges, as rebellions broke out across Rumelia, especially in Bosnia and Albania. Taking advantage of the temporary weakness in the military position of the Ottoman Empire following the Auspicious Incident, the Russian Empire forced the Ottomans to accept the Akkerman Convention on 7 October 1826. 1 2 3 Goodwin, pp. 296–299. ↑ George F. Nafziger (2001). Historical Dictionary of the Napoleonic Era. Scarecrow Press. pp. 153–54. ↑ Finkel, Caroline (2005). Osman's Dream. John Murray. p. 435. ISBN 0-465-02396-7. ↑ Barber, Noel (1973). The Sultans. pp. 135–136. ISBN 0-671-21624-4. ↑ Levy, Avigdor. "The Ottoman Ulama and the Military Reforms of Sultan Mahmud II." Asian and African Studies 7 (1971): 13 - 39.